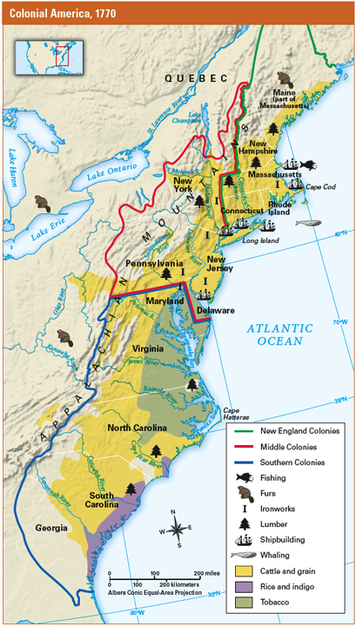 What were the similarities and differences among the colonies in North America? In the mid-1700s, a German schoolteacher named Gottlieb Mittelberger boarded a ship bound for the colony of Pennsylvania, in far-off North America. Mittelberger had borrowed the cost of his passage by signing on as an indentured servant. He would have to settle his debt by working for several years for the master who bought his services. Why were people willing to go through such hardships to come to the colonies? 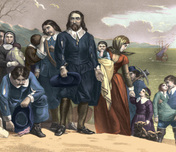 Many colonists came to North America for the chance to own land and start a new life. Others were seeking freedom to practice their religion. There were also some who did not have a choice. A number of convicts (people in jail) were forced to go to North America to work off their debts as indentured servants. Millions of Africans were kidnapped from their homelands and brought to the colonies as slaves. In this chapter, you will learn about the people who settled the English colonies. You will read in detail about 8 of the 13 colonies. As you do, pay attention to similarities and differences among the colonies in such areas as geography, economy, religion, and government. Use this map to answer the questions below. You will be expected to write in paragraph form, using APA citations in each paragraph. You may use the essay format that you have used in previous assignments. Use the past to support your view point for future decisions. You will need to develop a project that presents the ideas discussed within this unit of study in a unique way. Look through the "project ideas" page to get some inspiration. Projects must be 3 Dimensional or Digital. If you decide to do a Prezi as your project, it must include a recorded voice over component. Projects that are scored at a four will include information that has not been covered in the required readings. Good luck, and may the force be with you!